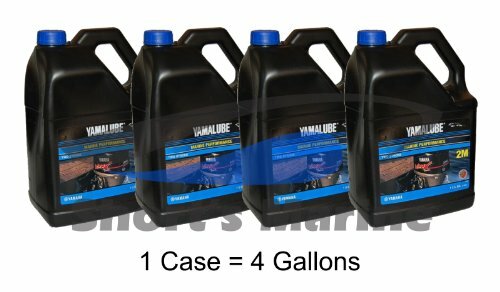 Case of 4 Gallons 2-M Yamaha 2 Cycle Engine Oil 2-Stroke Engine Oil Semi-Synthetic Injector Oil for Outboard Motors. Naturally, any outboard oil should be TCW-3 approved. Yamalube oils are so good they have actually been used as the test oil for many of the TC-W3 ratings! That means that all other TCW-3 oils had to measure up to our high standards. Given that, we raised the bar again with Yamalube 2-M - the new standard for outboard oils. Features Extreme Performance Formula. An exclusive additive blend works to guard against power robbing ring stick, and carbon build up, while special additives minimize wear. This oil has been designed for the most grueling conditions you outboard faces. Whether its extended full-throttle operation, or engine punishing & out of the hold acceleration, or even hour after hour of trolling, this oil stands up to the test. With this kind of extreme performance ability, Yamalube 2-M offers the best everyday protection too.Rust and Corrosion Protection This oil is formulated with the best rust and corrosion protection we could find. Formulated especially for outboard motors. Not recommended for WaveRunner or Sport Boats.